Tamarix ramosissima is a rampantly invasive shrub that has dominated riparian zones of arid climates. A massive invasion of T. ramosissmia in the western United States has dominated over a million acres. Typically found in conjunction with other Tamarix species and resultant hybrids, T. ramosissima displaces native plants, drastically alters habitat and food webs for animals, depletes water sources, increases erosion, flood damage, soil salinity, and fire potential. Tamarix ramosissima is a semi-deciduous, loosely branched shrub or small to medium-sized tree. The branchlets are slender with minute, appressed scaly leaves. The leaves are rhombic to ovate, sharply pointed to gradually tapering, and 0.5 - 3.0mm long. The margins of the leaves are thin, dry and membranaceous. Flowers are whitish or pinkish and borne on slender racemes 2-5cm long on the current year's branches and are grouped together in terminal panicles. The pedicels are short. The flowers are most abundant between April and August, but may be found any time of the year. Petals are usually retained on the fruit. The seeds are borne in a lance-ovoid capsule 3-4mm long; the seeds are about 0.45mm long and 0.17mm wide and have unicellular hairs about 2mm long at the apical end. The seeds have no endosperm and weigh about 0.00001 gram. (Carpenter, 2003; Dudley, pers. comm.). There are few plants that are true genetic species of Tamarix ramosissima in infested areas, at least in North America. Most of what is called T. ramosissima represents a variety of hybrids, including haplotypes of T. ramosissima, T. chinensis, T. gallica and others (Gaskin and Schaal 2002); it even hybridizes with athel (T. aphylla), an evergreen species, in some southwest U.S. locations (Gaskin and Shafroth, in press). The most common genotype in the U.S. is a morphologically cryptic hybrid of T. ramosissima and T. chinensis not detected in Eurasia (Gaskin & Schaal, 2002). Tamarix ramosissima will produce roots from buried or submerged stems or stem fragments. This allows the species to produce new plants vegetatively following floods from stems torn from the parent plants and buried by sediment. Ideal conditions for first-year survival are saturated soil during the first few weeks of life, a high water table, and open sunny ground with little competition from other plants. The seedlings of this species grow more slowly than many native riparian plant species and it is highly susceptible to shading (Carpenter, 2003). Often planted as an ornamental and to prevent erosion in arid areas. Tamarix ramosissima provides a nectar source for honeybees in some areas, and is widely used in the old world for furniture making and for firewood, for tannin extraction, and for cover for livestock (Dudley, pers. comm.). T. ramossisima may also be useful for bioremediation, for instance it takes up perchlorate from groundwater, perchlorate being a pollutant derived from jet fuel (Urbansky et al. 2000). Many species of native birds, including the endangered and federally protected south-western willow flycatcher (Empidonax traillii extimus), are able to exploit T. ramosissima for shelter and nesting, especially when some native trees remain (Fleishman et al. 2003). However, it is mostly foliage gleaners and fairly opportunistic species that use it to a substantial extent - cavity nesters like owls and wrens, drillers like woodpeckers and sapsuckers, frugivores, granivores and other specialists rarely occupy tamarisk (Ellis 1995, Shafroth et al. 2005, Hunter 1984, Hunter et al. 1985, Cohan et al. 1979, Lovich and DeGouvenain 1998, Dudley and DeLoach 2005) and usage by insectivores declines greatly as vegetation dominance by tamarisk increases (Yard et al. 2004). Tamarix ramosissima is highly fecund. It produces massive quantities of minute seeds that are readily dispersed by wind (Carpenter 2003) but are usually only viable for a few days (Dudley pers. comm.). T. ramosissima seeds have no dormancy or after-ripening requirements. Germination can occur almost immediately upon reaching a moist site, and germination conditions are broad, good germination being found from 10 to 35°C, but mid-summer seed collections indicated poorer germination rates than those collected in late spring (Young et al. 2004). T. ramosissima flowered in two flushes, one in April-May and another in late July in northern Arizona, presumably reflecting availability of spring snowmelt and summer monsoon moisture. This species flowered continuously under favourable environmental conditions but the flowers require insect pollination to set seed (Carpenter 2003). Tamarix ramosissima is a facultative phreatophyte, meaning that its roots are able to reach deep water tables but it is capable of tolerating periods without access to water (Carpenter 2003). Introduced as ornamentals and for windbreaks (Sobhian et. al 1998). Recommended citation: Global Invasive Species Database (2019) Species profile: Tamarix ramosissima. Downloaded from http://www.iucngisd.org/gisd/species.php?sc=72 on 22-04-2019. Tamarix ramosissima has displaced or replaced native plant communities and may be a major contributor to the decline of many native plants and animals, including endangered species (Dudley & Deloach, 2004). Alteration of natural flooding regimes through dam construction has resulted in T. ramossisima replacing many native tree species, such as cottonwood (Populus deltoides subsp. wislizenii) and willows (Salix spp. ), in riparian forests (Everitt 1980; Horton 1977; Robinson 1965; Graf 1978). The invasion of Tamarix ramosissima along streams is likely to have altered the food webs in these aquatic ecosystems (Kennedy & Hobbie 2004). The roots of T. ramosissima bind together gravel and cobble riverbeds, resulting in enlarged bars and narrowed channels increasing the likelihood of flood (Cooper et. al 2003). The leaf litter and foliage produced by T. ramosissima is flammable and encourages the spread of wildfires (Busch 1995; Brotherson & Field 1987; Dudley et al 2000). Native vegetation and wildlife is destroyed in these fires, while T. ramosissima seedlings are able to increase their spread. This is due to their ability to re-sprout more successfully than native plants following fire (Huntert et al 1988; Busch 1995; Ellis 2001; Dudley et al 2000). T. ramosissima is capable of utilizing saline groundwater by excreting excess salts through glands in the leaves causing an increase in surface soil salinity. This increase, combined with dense canopy of saltcedar plants and higher likelihood of fires within stands of saltcedar, results in the elimination of native riparian plants (APHIS, 2000). T. ramosissima is also known to transpire large amounts of groundwater, which dessicates soils and reduces the water table. Its transpiration rate is similar to native plants on a per-leaf basis but it maintains a larger leaf area per ground area, and therefore uses more water in total (Sala et al 1996; Dahm et al 2002; Shafroth et al 2005; Cleverly et al 2002). Because T. ramosissima can take up water from non-saturated soils, it has an added advantage in outcompeting native vegetaion (Dudley, pers. comm.). T. ramosissima posseses many physiological adaptations that allow it to replace the native tree species, especially along human-altered river stretches. These include: high seed production, rapid germination and seedling establishment, high growth rates, high ET rates, drought tolerance, extreme salt tolerance, flood tolerance, the ability to resprout after fire, and high leaf area index (LAI) allowing it to establish quickly and deplete water-tables at the expense of native species These advantages appear to be so overwhelming that, once it becomes established, eradication of it by human intervention is difficult but necessary to restore riparian corridors (Glen & Nagler, 2005). Mechanical: Hand pulling can be used where plants are small, access is difficult, or herbicides cannot be used (Carpenter 2003). Uprooting methods are effective in the short-term because uprooted trees do not resprout. For sawing and mowing, chemical treatment may be necessary to prevent resprouting. Immature plants may often be physically removed by hand with care given to complete removal of the root structure and disposal of the plant by burning or deep burial. Bulldozing, followed by root-plowing is successful, consistent and effective when used on large thickets of established Tamarix ramosissima. Managed flooding can effectively kill T. ramosissima on a long-term basis. Repeated flooding is necessary to kill saltcedar seedlings that are rapidly established from windborne seeds. Established saltcedar plants can tolerate flooding for up to 3 months. Conditions suitable for controlled flooding exist in relatively small areas such as highly managed wildlife refuges (APHIS, 2003). Chemical: Aerial application of the herbicide imazapyr, alone or in combination with glyphosate, is effective and practical for controlling T. ramosissima over thousands of hectares, particularly in dense stands where little or no native vegetation is present. Several field trials have produced control rates of > 90% after one or two years (Carpenter 2003). On smaller sites the cut stump method is successful when triclopyr herbicides are also used. Basal bark applications of Garlon4 were very effective on plants with a basal diameter of less than 4 inches. Burning, followed by herbicide application to the resprouts, also produced excellent results, although this method is not appropriate when T. ramosissima exists as a component of native plant communities (Carpenter 2003). The use of triclopyr (Garlon4 or Remedy) mixed with oil and applied as a basal bark or cut stump treatment has been used with great success on scattered infestations, with no resprouting occurring. The basal bark treatment involves applying the herbicide mixture to the lower 18 inches of the plant clear to the ground. Herbicides used at aquatic sites include Arsenal and Habitat. These are very effective as foliar treatments, but are not selective and must be used with care. Around 30% of tamarisk may resprout after three years when using these herbicides (Baker, 2005. pers. comm.). Biological: Cattle (and probably goats) will eat T. ramosissima. A biocontrol agent, the saltcedar leaf beetle (Diorhabda elongate), has been released in nine states (California, Oregon, Nevada, Utah, Wyoming, Colorado, Montana, New Mexico and Texas), excluding those areas where the endangered southwestern willow flycatcher (Empidonax traillii extimus is nesting in tamarisk (Dudley et al. 2001, DeLoach et al. 2004). The Athel Pine National Best Practice Management Manual brings together the best management practices available to date on control options for athel pine (T. aphylla), tamarisk (T. ramosissima) and smallflower tamarisk (T. parviflora). It also illustrates successful control programs with case studies that demonstrate how these weeds are managed effectively in Australia. Included are pointers to identify the Tamarix species you are dealing with as each of them are managed using different strategies. The manual includes a 'Decision Support Tree for Tamarix control' to develop a control program for athel pine, tamarisk or smallflower tamarisk based on the type of infestation you have to treat and the options available to you. Informations on Tamarix ramosissima has been recorded for the following locations. Click on the name for additional informations. Carpenter, Alan T. 1998. Element Stewardship Abstract for Tamarix ramosissima Ledebour; Tamarix pentandra Pallas; Tamarix chinensis Loureiro; Tamarix parviflora De Candolle. The Nature Conservancy. Centre for Invasive Species Research (CISR)., University of California Riverside. Text provided by Jeffrey Lovich, updated by Mark S. Hoddle. Cleverly, J. R.; Dahm, C. N.; Thibault, J. R.; et al. 2002. Seasonal estimates of actual evapo-transpiration from Tamarix ramosissima stands using three-dimensional eddy covariance. Journal of Arid Environments 52:181-197. Summary: Information on description, economic importance, distribution, habitat, history, growth, and impacts and management of species. Collins, J.N, May M, Grosso C. 2003. Salt cedar Tamarix spp. Practical Guidebook to the Control of Invasive Aquatic and Wetland Plants of the San Francisco Bay - Delta Region. Available from: http://legacy.sfei.org/nis/cedar.html [Accessed 22 May 2010]. D Antonio, C. M.; Mack, M. M.; and Dudley, T. L. 1999. Disturbance and biological invasions: direct effects and feedbacks. Pp. 413-452, In Walker, L. R. (ed.) Ecosystems of the World No. 16: Ecosystems of Disturbed Ground. Elsevier Press, Amsterdam. DeLoach, C. J.; Carruthers, R.; Dudley, T.; Eberts, D.; Kazmer, D.; Knutson, A.; Bean, D.; Knight, J.; Lewis, P.; Tracy, J.; Herr, J.; Abbot, G.; Prestwich, S.; Adams, G.; Mityaev, I.; Jashenko, R. ; Li, B.; Sobhian, R.; Kirk, A.; Robbins, T.; and Delfosse, E. 2004. First results for control of saltcedar (Tamarix spp.) in the open field in the western United States. R. Cullen, ed. XI Internat. Symp. on Biol. Control of Weeds, Canberra, Australia, pp. 505-513. Dudley, T. L. and Deloach, C. J. 2005. Saltcedar (Tamarix spp. ), endangered species and biological weed control � can they mix? Weed Technology (in press). Dudley, T. L.; DeLoach, C. J.; Lewis, P. A.; and Carruthers, R. I. 2001. Cage tests and field studies indicate leaf-eating beetle may control saltcedar. Ecol. Restoration 19: 260-261. Dudley, T. L.; DeLoach, C. J.; Lovich, J.; and Carruthers, R. I. 2000. Saltcedar invasion of western riparian areas: impacts and new prospects for control. Trans. 65th No. Amer. Wildlife and Nat. Res. Conf., March 2000, Chicago, pp. 345-381. Duncan, Keith W; McDaniel, Kirk C., 1998. Saltcedar (Tamarix spp.) management with imazapyr. Weed Technology. 12(2). April-June, 1998. 337-344. Early Detection and Distribution Mapping System (EDDMapS)., 2009. saltcedar Tamarix ramosissima Ledeb. Ellingson, A. R., and D. C. Andersen. 2002. Spatial correlations of Diceroprocta apache and its host plants: evidence for a negative impact from Tamarix invasion. Ecological Entomology 27:16-24. Ellis, L. M. 2001. Short-term response of woody plants to fire in a Rio Grande riparian forest, central New Mexico. Biol. Conserv. 97:159-170. Everitt, B. L. 1980. Ecology of saltcedar - a plea for research. Environmental Geology 3: 77-84. Gaskin, John F., 2003. Molecular systematics and the control of invasive plants: A case study of Tamarix (Tamaricaceae). Annals of the Missouri Botanical Garden. 90(1). Winter 2003. 109-118. Gaskin, John F.; Kazmer, David J, 2006. Comparison of ornamental and wild saltcedar (Tamarix spp.) along Eastern Montana, USA riverways using chloroplast and nuclear DNA sequence markers. Wetlands. 26(4). DEC 2006. 939-950. Gouldthorpe, Jonah, 2008. Athel Pine National Best Practice Management Manual: Managing athel pine and other Tamarix weeds in Australia. This manual is sponsored by the Australian Government and supported by the Northern Territory Government�s Department of Natural Resources, Environment and The Arts (NRETA). IUCN/SSC Invasive Species Specialist Group (ISSG)., 2010. A Compilation of Information Sources for Conservation Managers. Summary: This compilation of information sources can be sorted on keywords for example: Baits & Lures, Non Target Species, Eradication, Monitoring, Risk Assessment, Weeds, Herbicides etc. This compilation is at present in Excel format, this will be web-enabled as a searchable database shortly. This version of the database has been developed by the IUCN SSC ISSG as part of an Overseas Territories Environmental Programme funded project XOT603 in partnership with the Cayman Islands Government - Department of Environment. The compilation is a work under progress, the ISSG will manage, maintain and enhance the database with current and newly published information, reports, journal articles etc. Lesica, Peter; Miles, Scott., 2004. 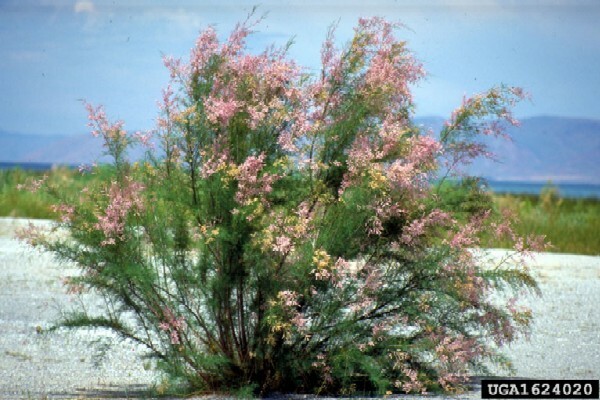 Ecological strategies for managing tamarisk on the C.M. Russell National Wildlife Refuge, Montana, USA. Biological Conservation. 119(4). October 2004. 535-543. Morisette, Jeffrey T., Catherine S. Jarnevich, Asad Ullah, Weijie Cai, Jeffrey A. Pedelty, James E. Gentle, Thomas J. Stohlgren, John L. Schnase., 2006. A tamarisk habitat suitability map for the continental United States. Frontiers in Ecology and the Environment: Vol. 4, No. 1, pp. 11-17. Muzika, R. M., and J. M. Swearingen. 1999. Tamarix ramosissima. Plant Conservation Alliance, Alien Plant Working Group. NatureServe. 2009. Tamarix ramosissima - Ledeb. NatureServe Explorer: An online encyclopedia of life [web application]. Version 7.1. NatureServe, Arlington, Virginia. Richard, R. 2003. Proposed program for control of saltcedar (Tamarix spp.) in 14 states. USDA-APHIS Draft Environmental Assessment, Nov. 2003. Washington, D.C.
Robinson, T. W. 1965. Introduction, spread and areal extent of saltcedar (Tamarix) in the western states. US Geological Survey Professional Paper 491-A. Sala, Anna; Smith, Stanley D; Devitt, Dale A., 1996. Water use by Tamarix ramosissima and associated phreatophytes in a Mojave Desert floodplain. Ecological Applications. 6(3). 1996. 888-898. Sexton, Jason P., John K. McKay, Anna Sala., 2002. Plasticity and genetic diversity may allow saltcedar to invade cold climates in North America. Ecological Applications: Vol. 12, No. 6, pp. 1652-1660. Shafroth, P. B.; Cleverly, J. ; Dudley, T. L.; Stuart, J.; Van Riper, C.; and Weeks, E. P. 2004. Saltcedar removal, water salvage and wildlife habitat restoration along rivers in the southwestern U.S. Envir. Mgt. (in press). Sher, Anna A. and Diane L. Marshall., 2003. Seedling competition between native Populus deltoides (Salicaceae) and exotic Tamarix ramosissima (Tamaricaceae) across water regimes and substrate types. American Journal of Botany. 2003;90:413-422. Smith, Stanley D; Devitt, Dale A.; Sala, Anna; Cleverly, James R; Busch, David E., 1998. Water relations of riparian plants from warm desert regions. Wetlands. 18(4). Dec., 1998. 687-696. Sobhian, R., L. Fornasari, J. S. Rodier, and S. Agret. 1998. Field Evaluation of Natural Enemies of Tamarix spp. in Southern France. Biological Control 12: 164-170. Sprenger, Matthew D; Smith, Loren M; Taylor, John P., 2001. Testing control of saltcedar seedlings using fall flooding. Wetlands. 21(3). September, 2001. 437-441. Tallent-Halsell, Nita G; Walker, Lawrence R., 2002. Responses of Salix gooddingii and Tamarix ramosissima to flooding. Wetlands. 22(4). December 2002. 776-785. Taylor, John P; Wester, David B; Smith, Loren M., 1999. Soil disturbance, flood management, and riparian woody plant establishment in the Rio Grande floodplain. Wetlands. 19(2). June, 1999. 372-382. USDA, NRCS. 2009. Tamarix ramosissima Ledeb. Saltcedar The PLANTS Database. National Plant Data Center, Baton Rouge, LA 70874-4490 USA. Bailey, J.K., Schweitzer, J.A., and Whitham, T.G. 2001. Salt cedar negatively affects biodiversity of aquatic macroinvertebrates. Wetlands. 21 (3): 442-447. Bean, D.; Chew, T.; Li, B.; and Carruthers, R. I. 2001. Diapause in relation to the life history of Diorhabda elongata (Chrysomelidae), a Eurasian leaf beetle introduced as a biocontrol agent of saltcedar (Tamarix spp.) (abstract). Entomol. Soc. America, San Diego. Brotherson, J.D. and Field, D. 1987. Tamarix: impacts of a successful weed. Rangelands 9(3): 110-112. Busch, D. E. and Smith, S. D. 1995. Mechanisms associated with decline of woody species in riparian ecosystems of the southwestern U.S. Ecol. Monogr. 65: 347-370. CONABIO. 2008. Sistema de informaci�n sobre especies invasoras en M�xico. Especies invasoras - Plantas. Comisi�n Nacional para el Conocimiento y Uso de la Biodiversidad. Fecha de acceso. The species list sheet for the Mexican information system on invasive species currently provides information related to Scientific names, family, group and common names, as well as habitat, status of invasion in Mexico, pathways of introduction and links to other specialised websites. Some of the higher risk species already have a direct link to the alert page. It is important to notice that these lists are constantly being updated, please refer to the main page (http://www.conabio.gob.mx/invasoras/index.php/Portada), under the section Novedades for information on updates. La lista de especies del Sistema de informaci�n sobre especies invasoras de m�xico cuenta actualmente con informaci�n aceca de nombre cient�fico, familia, grupo y nombre com�n, as� como h�bitat, estado de la invasi�n en M�xico, rutas de introducci�n y ligas a otros sitios especializados. Algunas de las especies de mayor riesgo ya tienen una liga directa a la p�gina de alertas. Es importante resaltar que estas listas se encuentran en constante proceso de actualizaci�n, por favor consulte la portada (http://www.conabio.gob.mx/invasoras/index.php/Portada), en la secci�n novedades, para conocer los cambios. Conway, Courtney J; Sulzman, Christina., 2007. Status and habitat use of the California black rail in the southwestern USA Wetlands. 27(4). DEC 2007. 987-998. Dahm, C. N.; Cleverly, J. R.; Coonrod, J. E. A.; et al. 2002. Evapotranspiration at the land/water interface in a semi-arid drainage basin. Freshwater Biology 47: 831-843. Evangelista, Paul; Kumar, Sunil; Stohlgren, Thomas J.; Crall, Alycia W.; Newman, Gregory J., 2007. Modeling aboveground biomass of Tamarix ramosissima in the Arkansas River basin of southeastern Colorado, USA. Western North American Naturalist. 67(4). DEC 2007. 503-509. Everitt, B. L. 1998. Chronology of the spread of saltcedar in the central Rio Grande. Wetlands 18:658-668. Fleishman, E., N. McDonal, R. M. Nally, D. D. Murphy, J. Walters, and T. Floyd. 2003. Effects of floristics, physiognomy and non-native vegetation on riparian bird communities in a Mojave Desert watershed. Journal of Animal Ecology 72:484-490. Gaskin, J. F. and Schaal, B. A. 2002. Hybrid Tamarix widespread in U.S. invasion and undetected in native Asian range. Proc. Natl. Acad. Sci. 99:11256�11259. Gaskin, J.F. and Shafroth, P.B. in press. Hybridization of invasive saltcedars (Tamarix ramosissima, T. chinensis) and athel (T. aphylla) in the southwestern USA, determined from morphology and DNA sequence data. Madro�o (in review). Gaskin, John F.; Schaal, Barbara A., 2003. Molecular phylogenetic investigation of U.S. invasive Tamarix. Systematic Botany. 28(1). January-March 2003. 86-95. Going, Barbara M; Dudley, Tom L., 2008. Invasive riparian plant litter alters aquatic insect growth. Biological Invasions. 10(7). OCT 2008. 1041-1051. Graf, W. F. 1978. 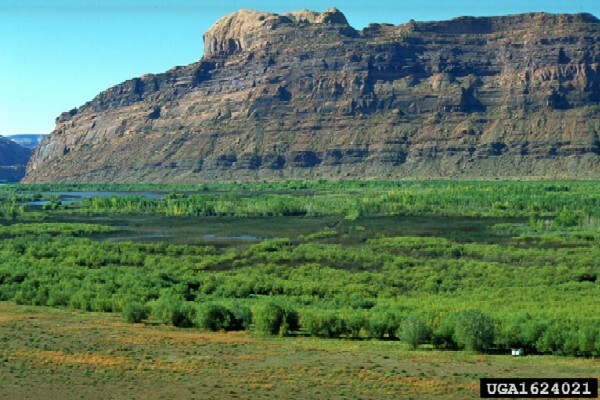 Fluvial adjustment to the spread of tamarisk in the Colorado Plateau region. Geological Society of America Bulletin 89: 1491-1501. Hart, C.R. 2003. Pecos River, Texas Restoration and Water Recovery. 2003 Tamarisk Symposium, Grand Junction, Colorado. 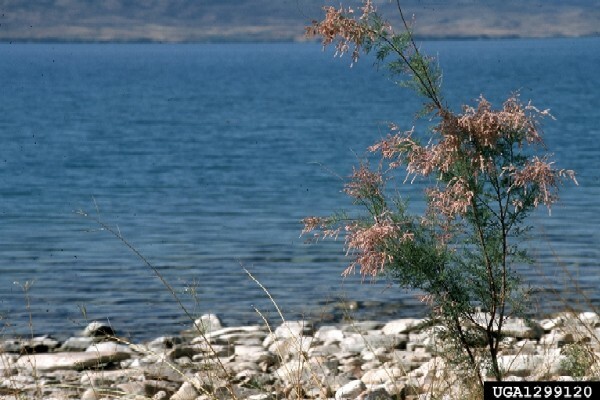 Summary: Presentation on the impacts and control of tamarisk along the Pecos River, Texas. Horton, J. S. 1977. The development and perpetuation of the permanent tamarisk type in the phreatophyte zone of the southwest. Pp. 124-127 In: Importance, preservation, and management of riparian habitat: a symposium. General Technical Report RM-43. U.S. Forest Service, Washington, D.C.
Hunter, W. C.; Anderson, B. W.; and Ohmart, R. D. 1988. Use of exotic saltcedar (Tamarix chinensis) by birds in arid riparian systems. Condor 90:113-123. Summary: An online database that provides taxonomic information, common names, synonyms and geographical jurisdiction of a species. In addition links are provided to retrieve biological records and collection information from the Global Biodiversity Information Facility (GBIF) Data Portal and bioscience articles from BioOne journals. Lovich, Jeff; Meyer, Kathie., 2002. The western pond turtle (Clemmys marmorata) in the Mojave River, California, USA: Highly adapted survivor or tenuous relict? Journal of Zoology (London). 256(4). April, 2002. 537-545. Natale, E. S; Gaskin, J; Zalba, S. M; Ceballos, M; Reinoso, H. E., 2008. Tamarix species (Tamaricaceae) invading natural and seminatural habitats in Argentina. Boletin de la Sociedad Argentina de Botanica. 43(1-2). JUL 2008. 137-145. Pearce, Cheryl M; Smith, Derald G., 2003. Saltcedar: Distribution, abundance, and dispersal mechanisms, northern Montana, USA. Wetlands. 23(2). June 2003. 215-228. Sala, A.; Smith, S. D.; and Devitt, D. A.. 1996. Water use by Tamarix ramosissima and associated phreatophytes in a Mojave Desert floodplain. Ecol. Applic. 6: 888-898. Sher, A. A,; Marshall, D. L.; and Taylor, J. P. 2002. Establishment patterns of native Populus and Salix in the presence of invasive nonnative Tamarix. Ecological Applications 12:760-772. USDA, ARS, 2009. Taxon: Tamarix ramosissima Ledeb. National Genetic Resources Program. Germplasm Resources Information Network - (GRIN) [Online Database]. National Germplasm Resources Laboratory, Beltsville, Maryland. Young J.A. ; Clements, C.D. ; and Harmon, D. 2004. Germination of seeds of Tamarix ramosissima. J. Range Mgt. 57: 475-481.